While blog hopping looking for new muffin recipes a few weeks ago I ran across Chocolate, Chocolate, and More blog and I suggest you check it out. She has amazing recipes to share. 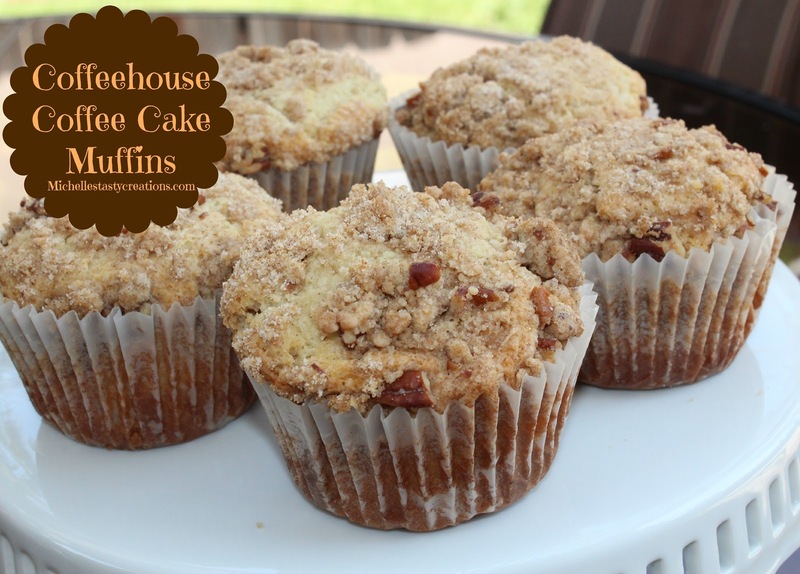 I found this recipe for Coffeehouse Coffee Cake Muffins and I was immediately hooked. I made them and they were DELICIOUS! They were super moist and had a cinnamon coffeecake flavor, sigh. Sorry, am I drooling again? You need to give these a try right now. Go! Line a 6-tin Jumbo or 12-tin regular muffin tin with paper liners and set aside. I use Jumbo muffin tins. In a small bowl mix the pecans, brown sugar, and cinnamon, and set aside. In a large bowl, combine the flour, sugar, and salt and stir to combine. Add the 8 Tbs. of cubed butter to the flour mixture and using a pastry blender cut the butter into the flour mixture until it resembles peas. Remove 1 cup of the flour mixture and add to the pecan/brown sugar mixture, stir to combine. Add the 2 Tbs. of melted butter to the pecan mixture and mix until combined. Add the baking soda, and baking powder to remaining flour mixture. In a small bowl combine the egg, sour cream, and vanilla extract until well blended. Pour egg mixture into the flour mixture and stir until combined. Batter will be very thick. Do not over stir. Add the 3/4 cup reserved pecan mixture to the batter and fold in with a spatula until just combined. Using an ice cream scoop, scoop the batter into the muffin tins and top with the Streusel topping, pressing the topping into the batter a little to keep it all on top. Bake for 18 - 25 minutes, checking after 18 by inserting a toothpick into the center and it should come out clean with maybe a little topping on it (or you can usually tell by looking at them if they need a minute or two more) Do not over bake. Remove from oven and cool in pans about 5 minutes then remove to a wire rack to cool. They are great when warm or at room temperature. You can find me linking up to these fabulous link parties each week. YUM YUM!! These look DE lish! Yum!! These look so delicious!! :-D I LOVE coffee cakes! What a great way to make coffee cake! Thanks for sharing! YUM, I love coffee cake! Thanks for the awesome recipe, can't wait to try these out! These muffins look so good. I really like the struesel topping. I would love if you would share this and any other post at Showcase Your Talent Thursday http://whatscookinglove.blogspot.com/2012/04/showcase-your-talent-thursday-4.html. I hope to see you there! Wow, those look amazing! :) Pinning! I love coffee cake, especially in muffins. So yummy! Stopping by from Totally Tasty Tuesday - pinned to share. I love that you tried these! Still in the top five for muffins in my house! Wow, those coffee cakes look divine!